After 15 years, this recording continues to be both popular and controversial. 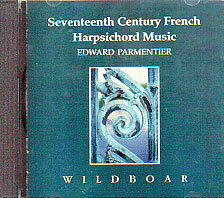 Now in its third pressing, it remains a favorite for Parmentier’s extraordinarily expansive readings of this beautiful repertoire, and controversial for its tangy meantone tuning, based on systems dating from c. 1600 (Zarlino, others) and advocated (if not prevalent) in Paris 60-75 years later. Froberger: Toccata IV, Canzon VI, Suite in C minor, Tombeau de Mons. De Blanrocher, Louis Couperin: Suite in D. Chambonnières: Pièces de clavecin in F; D’Anglebert: Prelude in G minor, Passacaglia d’Armide, Tombeau de Mons. Chambonnières.